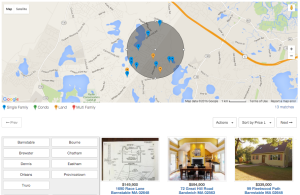 Maps offer expanded property search by location, using a Google Map. As selections are made on the page, the map updates in real-time. Search the map by dragging the circle. A unique and fun way to search properties is by exploring the map. As you drag or resize the circle, listings within the circle will refresh automatically. If this map is part of a Rover IDX Full Page, the entire page will refresh. You can create Defined Locations and display them on a map. A defined location is just a polygon, and can represent a neighborhood, subdivision, or any geographical location. You can display multiple defined locations on a map, and each can be clickable to display listings within that area. Furthermore, a map can be tied to a full Rover IDX page, and as selections are made on a map, the Rover searches for and displays those listings. Map markers come with a default set, and are completely customizable. Map infowindow popup is alway customizable.